This work focuses on performance art networks. The foundation and development of these virulent, globally active structures was not conditional on the Internet. It is a field that, despite its international presence and continuity lasting more than 20 years, has been documented in relatively few research projects. The Artists Village (TAV) in Singapore, PAErsche in Germany and Black Market International (BMI), which has no national localisation. A major part of this work will deal with the actions of these three networks, of which TAV and BMI were founded back in the 1980ies, when the notion of networking had a very different linguistic connotation. However, the visions and ideas of networking were already inherent in TAV and BMI. 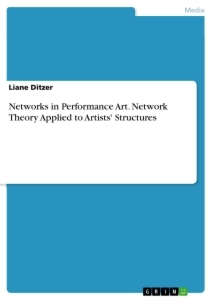 This work does not aim to carry out any basic research into the topic of networks, though it will investigate the factors that bring about and define the special performance art networks. The starting point for my studies was a personal 'accompaniment' of the performance art scene over longer periods of time. This included visits to several festivals and similar performance art events as well as a partial assistance or participation. These in turn led to personal contacts and I was able to gain an insight into these network structures in a manner that can be compared with field research. My research is based on a large number of different materials as well as documents that have not yet been wound up, archived or localised in an academic context. Those that display congruent or comparable statements on the basis of several different sources were ultimately used. Even when only one source is quoted in this work, it is always backed up by multiple confirmations of its content. I 'accompanied' the PAErsche network, which was founded in 2010 in Cologne, from its very beginnings and was a witness to an identification process and processes of group dynamics. The goal of this work is to explain the network behaviour of performance art: how does it work, act and interact? Under which premises does this kind of artists' network work; how does it finance itself, communicate with other local and international networks? It will also look into the special quality of 'performance art networks' under the aspect of individual requirements. What mental attitude does an artist have to bring with them to be anchored in such a network. Is the laconic statement on an artist's personality: 'Art is Ego' by Ben Vautier reconcilable with the idea of a network? I will begin by discussing the use of the term 'network'. When did it enter linguistic terminology and how did its usage change? Three network theories that are of significance for this work will also be presented. Georg Simmel with his question: "How is society possible", Gilles Deleuze and Félix Guattari with the concept of "rhizomes" and the postulation of a new mindset. The third theory that will be outlined is a new one developed in the 1990ies by Bruno Latour and others, the "actor-network theory”. I will finally explain the way I have used the notion of networks in this work in chapter 1.4. The aim of the 2nd chapter is to make it clear that 'networking' is by no means an invention of the modern age. It will provide an impression of the diversity of ways in which the avant-garde of visual artists tried to develop new and alternative structures of living and work towards the end of the 19th century as a reaction to the industrial revolution and the resulting upheavals. Chapter 3 will spotlight historical factors that favoured the emergence of performance art networks. This will outline the social, economic and political circumstances as well as the individual conditions and requirements that encouraged the emergency of these fragile networks. In chapter 4 I will begin by describing the performance art scene before going on to present the three performance art networks named at the beginning by way of example. The final chapter deals with structures and collaborations of the performance art networks. The historical development will once again be taken into account and the goals and content of the performance art events as well as the organisational structures and financing will be described. The conclusion deals with the topic of taboos, censorship and rules of performance art in general and of the networks in particular. The expected perspectives resulting from the overall picture of these investigations will be summarised in a concluding résumé. The first illustrations of networks appeared around 1500 in the form of tree diagrams. According to the artist and computer scientist Dirmoser, who has been scientifically involved in the visualisation of networks for many years, natural scientists in particular use 'tree graphs' – for example Charles Darwin for his theory of evolution. At the beginning of the 20th century the term network was coined for technical systems that required an input and an output. It was initially used in market technology to show infrastructures, through also for rail and road traffic as well as for the water, electricity and telecommunications networks that had to be built. Georg Simmel laid a cornerstone for social network theories with the notion of the 'interaction between people'. (See chapter 1.1) Moreno came up with one of the first practical uses of the term word network for social analysis with sociometry. In 1916 he was responsible for hygiene in the barracks in Mitterndorf near Vienna. He was interested in the mutual sentiments and social tension between farmers and workers, administrative staff, camp inmates, men and women. He was able to identify affective group structures of persons in particular with sociometry . The term network did not become widely accepted in sociological considerations until 1930 and after (see Schüttpelz, Erhard). As of the 1970ies, numerous social media and communication scientists such as Radcliff Brown, the research group around Harrison White, Colin Cherry and Bruno Latour, extended and verified these theories. The term networking became poplar in contemporary art and culture in the 1980ies. A change took place from a technological concept to a communicative one. Network radio developed a 'different radio', in which listeners were able to participate. Any actions in today's civilised cultures appear almost unthinkable without 'networking'. It doesn't matter whether these are private, professional, economic or political networks, everything seems to be digitally 'linked' into one huge network. The term network has become all-embracing and dominates current linguistic usage. Since the middle of the 1990ies the term network has stood for the Internet and is connected to the technical developments this has brought about. Virtual platforms such as Xing, LinkedIn, You Tube, Facebook and Twitter, to name but a few, in the meantime lay claim to the absoluteness of the concept amongst young people. Parallel to the linguistic usage in electronics, the network concept is also used in an inflationary way to describe any kind of social structures and phenomena. This ranges from sports clubs, NGOs through to terror networks. The extent to which this quotation is relevant for performance art networks has to be investigated in the further course of the paper. It is interesting, however, to note that two of the networks I investigated were founded before the appearance of the Internet and maintained an 'analogue' communication with each other and in other structures by air mail, telephone and facsimile up to the 1990ies. Georg Simmel can be called the founding father of the network theory. Starting from the question "How is society possible", he laid the cornerstone of the exchange theory in 1908 with his concept of 'interaction'. Simmel regards "interaction as the basic element of sociology". He therefore in principle expresses the central idea of a definition of a network: exchange as an interaction between the protagonists and their mutual relationships. What is significant for Simmel is that social structures, though also individuals, always interact with other protagonists. Social structures are based on an exchange. No individual can live completely autarkic in his or her environment without interaction with other individuals. According to Simmel, this leads to different opinions and points of view that are shaped by the relevant living conditions or local circumstances. In the works "About social differentiation" (1890) and "The metropolis and mental life" (1903), Simmel traces the emergence and development of social relationships. They deal with how social networks change when they are transferred from the country to the city and encounter a much more complex structure of human relationships. Simmel thus believed that the city guaranteed the chance of more individuality. According to Simmel, self-fulfilment is much more difficult in the countryside than in the city on account of close social relationships, unlike in the city where on can act more freely. Simmel also broached the issue of the risk of alienation and isolation through individuality. Put differently: the bigger the social unit is, the less able the individual is to bond emotionally to this. Gilles Deleuze and Felix Guattari, linguists and philosophers, use the term 'rhizome', taken from the field of biology, for their epistemological positions. In biology a rhizome is defined as a generally underground – in other words not necessarily visible – system of stems. Nodes can form at any point, internodes dissolve, develop further on their own and produce further independent plants through the division and separation of individual parts of this network of roots. Philosophy uses this concept as a metaphor and matrix. For example, the development of a book is described as a complex interaction of ideas, technologies and physical levels. In their work, Deleuze and Guattari primarily aim at breaking through the strictly hierarchic principle of the language and letters of classic structuralists and therefore opened up a particular way of thinking. "There is no language in itself, nor are there any linguistic universals (…)"
Summing up, it becomes clear in "Rhizome" that Deleuze and Guattari actually postulate a new way of thinking with their wish for a rhizome-like language, an appeal that can be found on page 41: "Make rhizomes, not roots, never plant! Don't sow, grow offshoots! Don't be one or multiple, be multiplicities! Run lines, never plot a point ! (...) Don't bring out the General in you!" This describes an essential part of an 'ideal network theory'. 'Ideal' should be understood as the rejection of a sovereign way of thinking and the lack of any hierarchy. Deleuze and Guattari were probably the first western philosophers of modern times who manifested the main aspects for the ideal state of a network. In the 1990ies the term 'rhizome' became increasingly popular to describe Internet structures. An ostensibly logical definition, but the structure of the Internet by no means exists without hierarchies: web domains are sold according to the principle of the 'highest bidder' and search engines filter results according to the 'principle of attention'. The French sociologists Bruno Latour, Michel Callon, John Law and others have been developing the "actor-network theory" since the 1980ies. Unlike Simmel, Latour's "Reassembling the Social: An introduction to Actor-Network-Theory (ANT)" that was published in 2005 does not describe a theory with which one can 'work'. "It is a theory and a strong one actually, I believe, but a theory of how to examine things, or rather, how they should not be examined – or rather how the actors are left a little space to express themselves"
It is a tool that I too will be using to understand the complexity and meaning of the actors in the performance art scene. Latour's approaches call for a better, more precise description: "I would say that if you description needs an explanation, it's not a good description (…)." He sees in the actors, irrespective of whether these are hybrid spirits, objects or humans, the possibility of getting to the bottom of social structures, groups and situations by giving the actors space to develop on their own and not to think in categories from the outset. Latour postulates social research that approaches the field under investigation impartially without a hypothesis that is to be verified. This means the necessity of an extensive acquisition and collection of data, particularly for the complexity of networks. Georg Simmel sees society as being based on reciprocal relationships between actors. The dynamic processes resulting from this can act as a catalyst for change in societies. If the actors are from different 'milieus' and come into contact with each other during their lifetime in particular, an exchange may take place between heterogeneous sociologies. The ability to play an equal part in the form of the 'gift' and reject hierarchies is one of the essential conditions for participating in performance art networks. These also include the mental readiness to act within a network and to be open to a global exchange of artistic ideas and visions. One of the early artists' groups from this era that is documented were the artists around Friedrich Overbeck and Franz Pforr in Vienna who were called the Nazarenes. In 1810 they emigrated to Rome. On account of their philosophy, a harking back to the Renaissance, and their appearance, wearing hats and long hair, they were called the "Nazarenes". In 1830 the composer Bartholdy Mendelssohn describes them as 'dreadful creatures' who sit in the Cafe Gredo. The Nazarenes initially alluded to the renunciation of academicism, later to the ideals of the mediaeval crafts and guilds. However, they were less interested in an exchange with other artists outside the group. Their structure and way of life served as a romantic opposite to the emergent industrialisation and the concomitant alienation of man from nature. Even if this group was at times very dogmatic, " the Nazarenes showed that such an artists' collective was viable and liveable." Projects in which artists joined together also appeared in conservative structures. The Düsseldorf school of painting (1819 to 1918) for example, developed international contacts and gained a worldwide reputation with a complex network – through classical genre painting combined with intelligent marketing. These encounters led to a potentialisation of opportunities. Eventually, however, this school of painting split up because the hierarchically structured network increasingly lost touch with the zeitgeist. Numerous artists' collectives arose such as Barbizon (1830), Auvers–sur–Oise (1860), Pont–Avent (1886) or Monte Veritàs (1900). The artists followed the 'call of nature' in Germany too, as evidenced by the artists' colonies Kronenberg (1858), Dachau (approx. 1875) or Worpswede (1889). These were by all means a kind of network because " there was a brisk coming and going between these places, the artists' colonies were linked by an inter-local network that also overcame national borders." Beyond this common fate, in intensive, intellectual exchange of opinions on modern painting also developed. More and more movements and programmatic artists' groups appeared. Examples that can be named include 'Der Blaue Reiter', 'Die Brücke' or 'Les Fauves'. "(...) Around 650 works of art – 130 of these alone paintings by van Gogh, (...) 25 by Gauguin, 32 by Munch and 16 by Picasso – were on show in the purpose-built exhibition hall. The spectrum of exhibited art ranged from Post-Impressionism through toe German Expressionism, the young painters from the Brücke and the Blauen Reiter“. At almost the same time, the Futurists were founded in Italy with Marinetti as their 'Chief ideologist' and Dada in Switzerland. Interdisciplinary contacts failed on account of the contrary opinions. The main accent of most of these groups was to explore new possibilities for collective working, living, thinking as well as the affinity to the big social utopias and an 'improvement' of societies. The numerous manifestos of this era bear witness to the dogmatism of individual groups. On account of this melange it is not surprising that conflicts quickly arose and the artists' collectives rarely lasted for more than a decade. " Since the majority of artists' collectives are made up of strong-willed personalities wanting to express their own opinions, the latent tension between individuality and sociality makes them very susceptible to conflicts." The rubble heaps of the destroyed cities in Europe made way for new hopes after the Second World War. People began to live and enjoy life again. Starting with an everyday culture such as washing machines, telephones and TV right through to the prophecies of nuclear energy and space travel, it seemed that anything was possible. The questions of guilt for the disasters of war were increasingly suppressed and intellectuals and artists in particular reacted against this. More radical artistic concepts and actions developed, mainly in Europe, the USA and Japan. The international avant-garde movements of the 1950ies followed various ideals. They overlapped at points or operated in parallel. In France it was the Lettrists, from whom the Situationist International developed, in Austria the Vienna Group, in Japan Gutai and many more. "We unwittingly enabled terrorism" said Mary Bauermeister pensively in an interview for the WDR during a big retrospective on Happenings and Fluxus. She later qualified this statement and spoke only of aesthetic terrorism. Gutai developed at the same time in Japan. The movement was important for the Japanese Fluxus annexe 'Hi Red Center' and later Asian performance art networks as a role model for a separate identity. Jiro Yoshihara founded the Gutai Group in 1954 in Osaka/ Japan. She dealt with material explorations (Murakami: penetration of paper panels, 1955) and performances ("Sky Festival"1960). They became particularly well-known for their 'Action Painting'. Their central subject was the exposure of the material: "to let the life of the material live" (manifesto of Yoshihara, 1956). The group broke up in1972 after Yoshihara's death. The reciprocal interaction between Western and Japanese avant-garde is still subject to some big misunderstandings to this day and according to the art historian Alexandra Munroe, the examination of Japanese art history is in its infancy. Her interview with Ming Tiampo in 2013 on the big Gutai retrospective in the New York Guggenheim Museum, appears to be proof:“modernism was a closed system, located in the West and relentlessly disseminated to its territories with no reciprocal exchange.”  This can be refuted partly through numerous quotes from Japanese and Western artists who by all mean maintained a dialogue (see footnote 48), not least through artists such as Takako Saito and Yoko Ono, who were part of the Fluxus movement. George Maciunas from Lithuania was the ideological founder of Fluxus. He drew up a manifesto and decided who was part of Fluxus and who wasn't. But the idea was much bigger and had already developed further that he would have admitted. " Even if Maciunas was ideological and dogmatic, the potential of the open group lived from the free spirit of its protagonists. Maciunas actually already failed with his definition of who was part of the Fluxus movement and who wasn't." Fluxus was a movement that one either felt part of or didn't. Fluxus – like Dada – was concept 'anti-art', in other words and artists' movement against 'elitist high art'. Apart from action art, concepts for alternative ways of living together also played a role here. Maciunas had already visited an island with friends where they all wanted to live and Joe Jones was ordered to qualify for a pilot's license. Fluxus was an international movement that revolved not least around the idea of a humane, intelligent, humorous and solidly united artistic articulation. For example, it was quite common for another artist in the group to create a performance, or to develop joint work. Nam June Paik performed the 'TV -Brah' together with Charlotte Moorman and Charlotte Moorman showed 'cut pieces' by Yoko Ono. The Fluxus network can be called the pioneer of performance art networks. With reference to chapter 2, it requires a certain mixture of social, socio-political and economic factors to favour or trigger developments. Consequently, the performance art networks did no develop accidentally in the 1980ies and 90ies. Exemplary aspects were: the progressive 'globalisation of cultures' – not least through the medium of TV – the increasing use of digital media, the expansion of mass tourism – with the resulting drop in costs of travel. Not forgetting a programmatic opening of Western cultural institutions such as the Institut Français or the Goethe Institut; they no longer exclusively exported their own culture to the relevant countries but also developed – depending upon the incumbent head of the institute – more or less ambitious projects that increasingly involved local artists. The development of the Internet did not induce the performance art networks but it did provide them with an extremely important communication platform for organisational matters. In order to take into account the various factors that led to the emergence of performance art networks, a differentiated consideration of the social and political circumstances in the respective cultural areas is necessary. was formed in 1988 in Singapore, which was still marked by the independence it had gained in 1963 and the resulting problems at the beginning of the 1980ies. The country was fraught by high unemployment and ethnic conflicts. What's more, events were still determined by a latent search for identity and the resulting dissociation and differentiation to the neighbouring countries of Malaysia, Indonesia as well as China. There were no resources for an independent cultural policy and artists could only study at a traditional art school. Anyone who wanted to learn more about the contemporary avant-garde went abroad. " (...) and there is no one to talk to, to discuss new ideas, or to brain storm. Artist here don't argue. You have difficulty trying to get someone to talk to you about Marcel Duchamp or Man Ray"
 TAV brings together artists from various ethnic groups: Malaya, Chinese, Indians etc./ BMI from various continents: Asia, Europe, Central America etc. PAErsche from various nationalities such as: Mexico, Netherlands, Belgium. Austria etc.